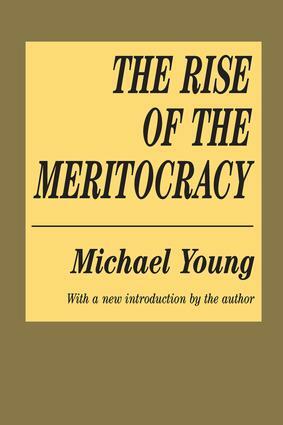 Michael Young has christened the oligarchy of the future Meritocracy. Indeed, the word is now part of the English language. It would appear that the formula: IQ+Effort=Merit may well constitute the basic belief of the ruling class in the twenty-first century. Projecting himself into the year 2034, the author of this sociological satire shows how present decisions and practices may remold our society.It is widespread knowledge that it is insufficient to be somebody's nephew to obtain a responsible post in business, government, teaching, or science. Experts in education and selection apply scientific principles to sift out the leaders of tomorrow. You need intelligence rating, qualification, experience, application, and a certain caliber to achieve status. In a word, one must show merit to advance in the new society of tomorrow.In a new opening essay, Young reflects on the reception of his work, and its production, in a candid and lively way. Many of the critical ambiguities surrounding its original publication are now clarified and resolved. What we have is what the Guardian of London called A brilliant essay. and what Time and Tide described as a fountain gush of new ideas. Its wit and style make it compulsively enjoyable reading from cover to cover.